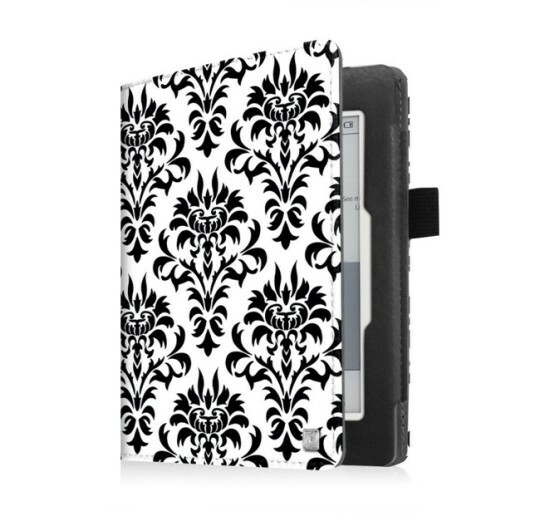 In this updated overview you’ll find fashionable covers and accessories for both Nook e-readers and tablets. 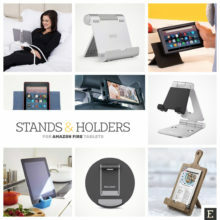 Most Nook owners buy accessories for their new devices either in Barnes & Noble stores nationwide or online at bn.com. 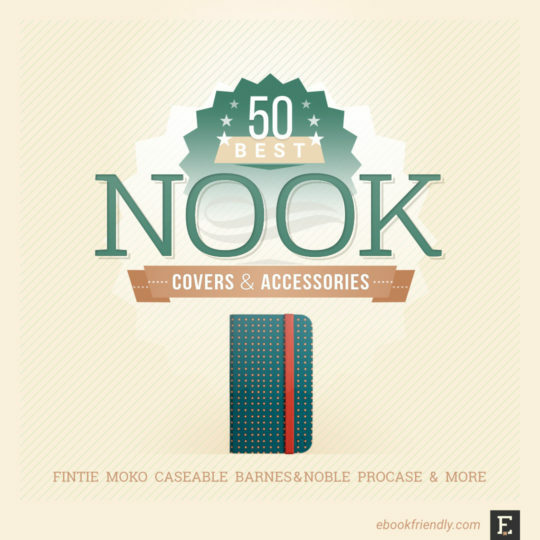 In this post, however, we’ve put together the best Nook cases and accessories not only from Barnes & Noble website but also other online stores. And you’ll be surprised to find out how well-designed are third-party covers. Barnes & Noble is famous for their stylish Nook accessories. They are, however, not receiving good reviews, and it looks like the style was more important for the designers than functionality. Third-party covers are well-tried constructions and are offered in a plenty of colors and designs. There are not so many cases made specifically for Nook devices, but you can extend the search by picking up the case for other devices. Nook Tab E is the same as 9.6-inch Samsung Galaxy Tab E.
Knowing the exact dimensions of your Nook is a good idea if you are going to buy the sleeves or cases made to order on such sites as Etsy. When you compare the sizes, you will discover that Nook GlowLight Plus is almost the same in size as Kindle Paperwhite. Therefore, you will be able to pick up for your Nook any Kindle Paperwhite case that keeps the device in place using elastic corner straps. Barnes & Noble sells the same cases for both 7-inch Nook Tab 4 (earlier model) and Nook Tab A (2016). However, although the dimensions of both devices are almost the same, the position of the rear camera is slightly different. 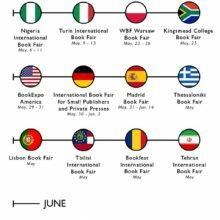 Therefore, the case originally developed fo the earlier Nook Tab 4 will partly cover the camera in Nook Tab A.
Amazon – the giant online store offers the largest selection of all kinds of e-reader accessories. 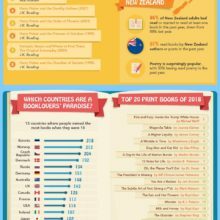 There are over 800,000 results for a search phrase “Nook case”. Just like any other overview from the Best 50 series, we are updating this list regularly. 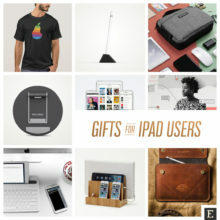 Also, make sure to check out our Nook cases infographic to see all the best designs in one image. If you know of any covers that are suitable for any of the currently offered Nook models, please share them on social media mentioning us. 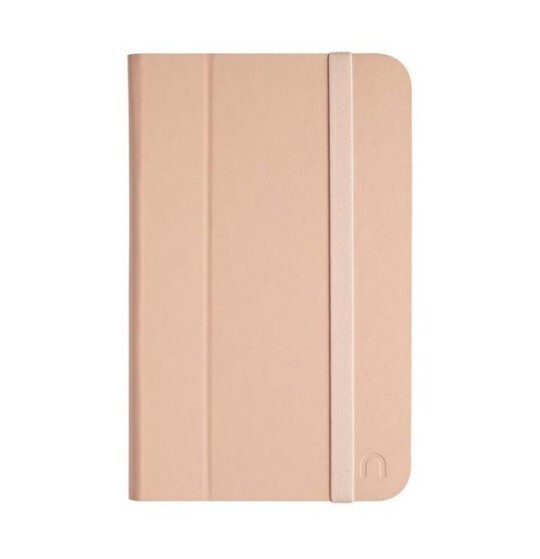 Original Nook Tablet 7 2016 cover. Let’s start from the original accessory that’s available in Barnes & Noble stores and online. 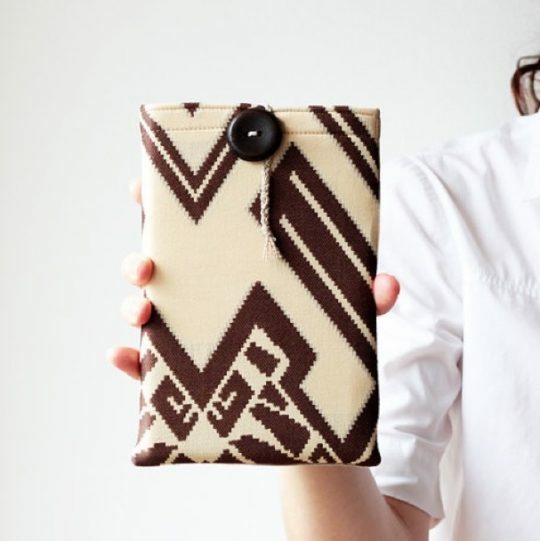 This case cover is a typical Nook design: opens like a book, with a plastic shell that holds a device in place, and a hand strap. Above, you see Evergreen Botanical Dream design, but you can choose from fifteen other fashionable colors, including our favorites: Multi Sparkle and Cabernet Denim Dots. ⇢ Barnes & Noble – $14.95. i-UniK Nook Tablet 7 2016 Folio Case. 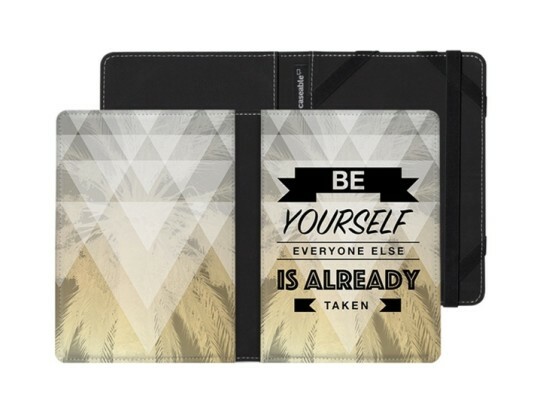 From i-UniK comes a folio case custom-made to fit the 2016 7-inch Nook Tablet. You can use it as a stand, with three different angles. The case has a built-in SD-card storage, closes with a magnetic clasp, and is shipped with a free stylus. Available in six colors: Camo (shown above), Black, Navy Blue, Cute Pink, Hunting Tree Camo, and Purple Polka Dot. ⇢ Amazon – $9.99. EpicGadget Nook Tablet 7 2016 Slim Folio Case. 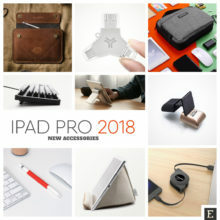 If you are looking for something more functional, this trifold case from EpicGadget is an interesting option. The front cover folds twice, turning the case into a horizontal or vertical stand. Horizontal position is great for typing, while vertical – for watching movies. 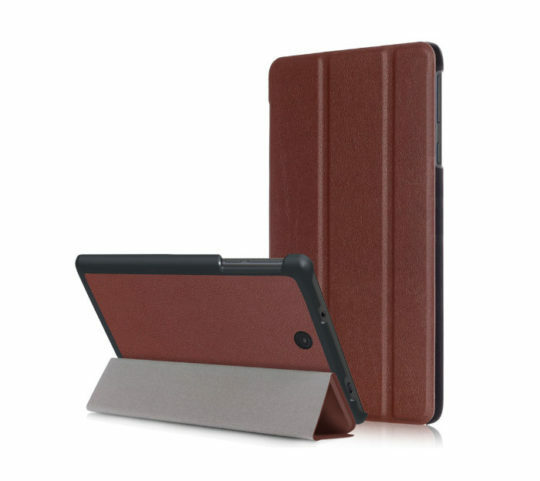 Slim Stand Leather Shell Skin Case for Nook Tablet 7 2016. It turns out the same trifold case like the one you’ve seen above can be bought in different online stores at different prices. It’s available as an unbranded case on eBay, in the same range of colors, so if you want to save a few more dollars or prefer eBay to Amazon, check it right now. ⇢ eBay – $8.05. 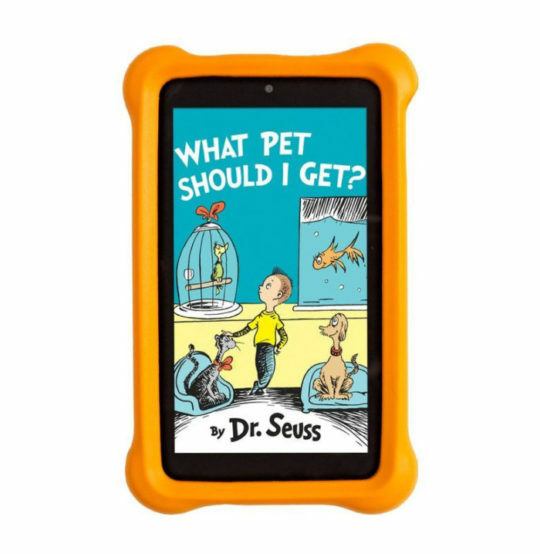 Nook Tablet 7 2016 Foam Bumper Case for Kids. The $50 Nook tablet? Quite possibly your kids are going to keep it for longer than you think. Make the tablet kid-friendly and get a protective silicone case that should resist bumps and jumps. Barnes & Noble offers the original bumper case in four bright colors: Lime, Pink, Citrus, and Scuba Blue. ⇢ Barnes & Noble – $19.95. Protective Semi-transparent Nook Tablet 7 2016 Case. Kid-proof cases are perfect for heavy users. If you, however, want something more universal (that can be used by kids and their parents), this simple case from a flexible polyurethane should meet all your needs. ⇢ eBay – $8.99. Marston Bindery Vintage Book Universal Tablet Case. 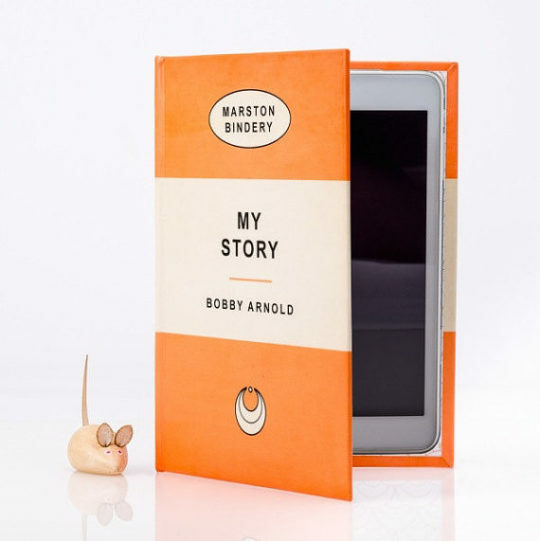 Wouldn’t you like your Nook Tablet to look like a vintage book with a familiar Penguin cover design? Meet Marston Bindery case. 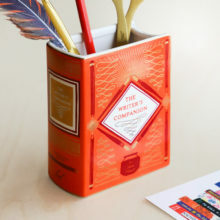 It’s hand-crafted in Leicestershire, UK, using traditional book binding materials and techniques. 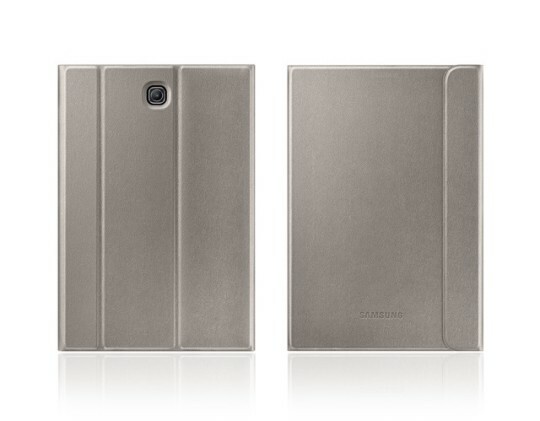 To get the case for Nook Tablet, please select “Medium” in the Size panel. You can have the case with or without the built-in stand. ⇢ Etsy – £29.99. 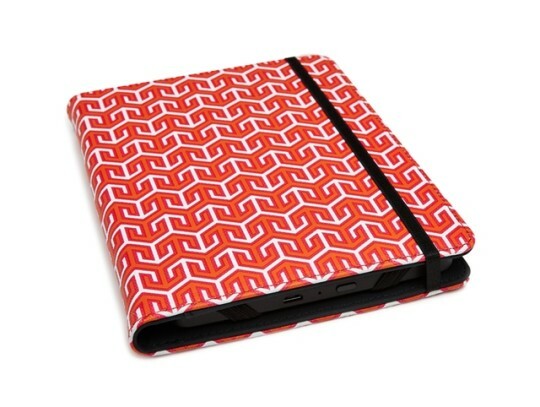 Gala Born Tribal Sleeve for 7-inch tablets. From a range of extremely fashionable and unique sleeves offered by Gala Born comes a Tribal design. The front is made from viscose; monochrome cotton fabrics is used for the back side. There is also a felt lining to increase the protection. The sleeve closes with beautiful wooden button and hand-braided string. ⇢ Etsy – £18.52. 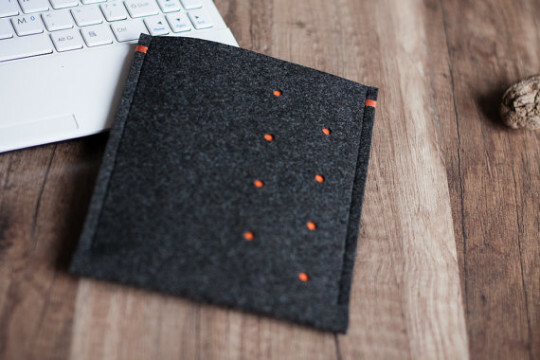 MoKo Felt Sleeve for 7-inch tablets. 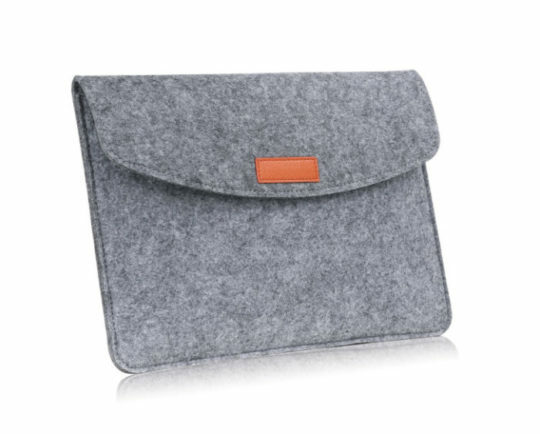 This fashionable felt case from a popular case producer MoKo is designed to fit 7-inch devices, and that includes Barnes & Noble Nook Tablet 7. The sleeve is made of a premium felt. The interior is lined with a material that is mold-proof, wear-resisting, and soft so that it won’t scratch your device. The sleeve has a smaller compartment for essential documents, and two back pockets for a phone, earphones, or keys. ⇢ Amazon – $14.99. Wisers Folio Case for Nook 7 Tablet 2016. Here is another proposal for anyone who is looking for solid folio cases. The one from Wisers has a microfiber interior to protect the screen from scratches, and a faux-feather on the outside. It has precise cut-outs for ports, buttons, and a speaker. Fold the front cover completely, and use a back-flip to turn the case into a stand. Available in four colors: Black, Navy Blue, Purple, and Gold (see above). ⇢ Amazon – $9.99. BlueCase Samsung Galaxy Tab A Sleeve. 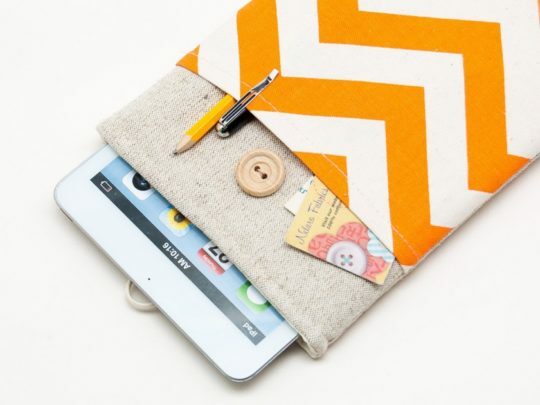 From our favorite Etsy shop, BluCase, comes a lovely sleeve hand-crafted from natural washed linen, and padded with 5mm lightweight foam for full protection against bumps and scratches. The sleeve has a large exterior pocket, and closes with a stylish wooden button. BlueCase offers a huge selection of colors to choose from. There are size versions for Galaxy Tab A 7.0, 8.0, and 9.7. ⇢ Etsy – $23. WizFun Samsung Galaxy Tab A 7.0 Case Cover. Designed specifically for the 2016 Galaxy Tab A 7.0, this case cover has a built-in stand, and allows access to all ports and buttons without the need to remove it. On the picture above you see Sail Blue design, but there are twelve more to check out, including Polka Dot (Rose and Purple). ⇢ Amazon – $6.99. Infiland Tri-Fold Smart Case for Samsung Tab A 7.0. You are looking at one of the hottest color patterns of recent months: Color Diamond. It’s offered in a slim case from Infiland that folds to form a vertical or horizontal stand and combines hard shell with soft microfiber interior. You can choose from thirteen colors. Besides Color Diamond, there are Lucky Tree, and Starry Night. ⇢ Amazon – $10.95. ProCase Samsung Galaxy Tab A 7.0 Stand Folio Case. A classic, executive-style case made from quality materials and available at attractive price. Thanks to folio construction, it transforms into a stand with three viewing angles. The cover comes with a free ProCase stylus. Available in three colors: Black, Brown, Red (above), and Navy. ⇢ Amazon – $14.99. Magnetic Flip Stand Case for Samsung Galaxy Tab A. You can choose a size version for Galaxy Tab A 7.0 or 9.7. 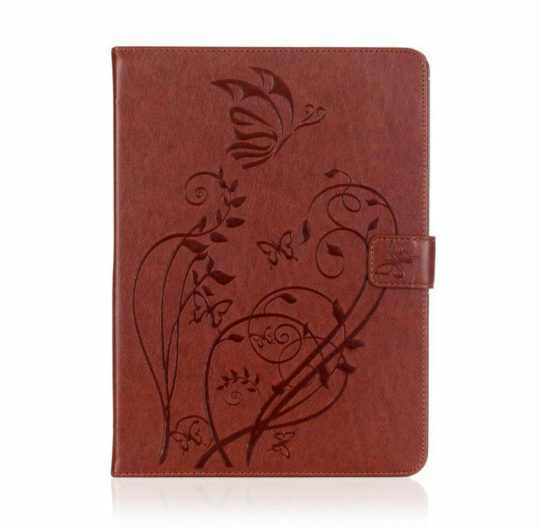 Made in China, this generic case looks really good and refers in style to a leather-bound book. The case folds into a stand, on the inner side of the front cover there is a large pocket as well as pockets for credit cards. Available in eight colors, including Rose, White, Pink, and Brown (shown above). ⇢ eBay – $9.99. 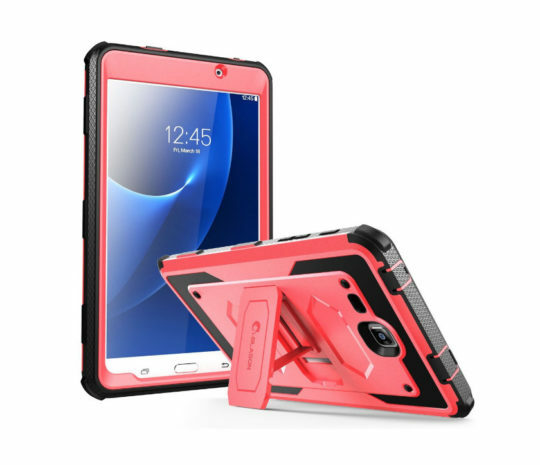 rooCASE Dual-View Samsung Galaxy Tab 4 Case. Fits Galaxy Tab 4 7.0 and 10.1. This PU leather cover has soft non-scratch microfiber interior. It features a patent-pending detachable inner sleeve that transforms into a landscape or portrait display. 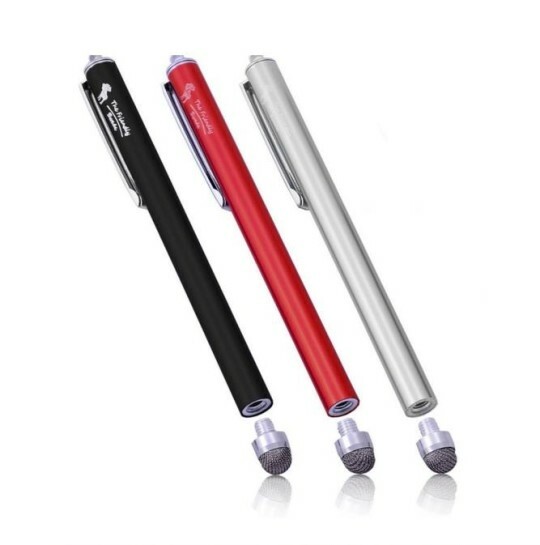 The case comes equipped with the 3in1 capacitive stylus. Available in several colors, including Brown, Magenta, Polkadot Pink (shown above) and Polkadot Black. ⇢ Amazon – $12.99. Noarks Nook Tab 4 7.0 Flip Stand Case Cover. 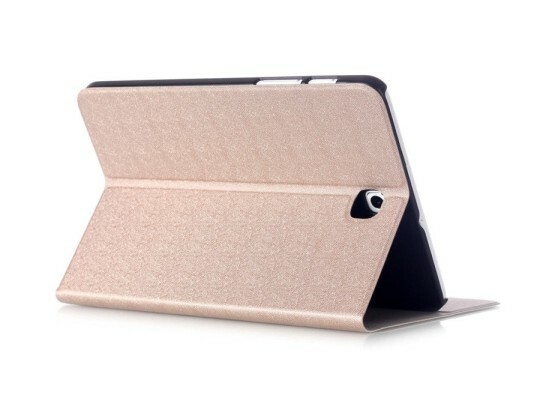 This foldable case can serve as a viewing and reading stand. It gives full access to all features and ports. Magnetic closure makes it easy to open and close the Galaxy Tab 4 Nook. 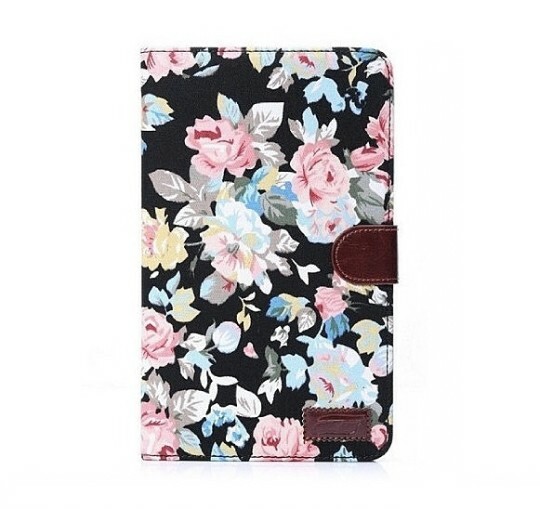 There are three flower patterns to choose from: Black Pink, Blue Pink, and White Pink. ⇢ Amazon – $7.99. 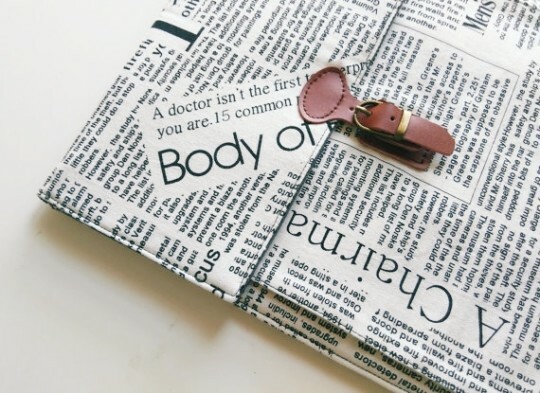 BokoShop Tablet Sleeve. 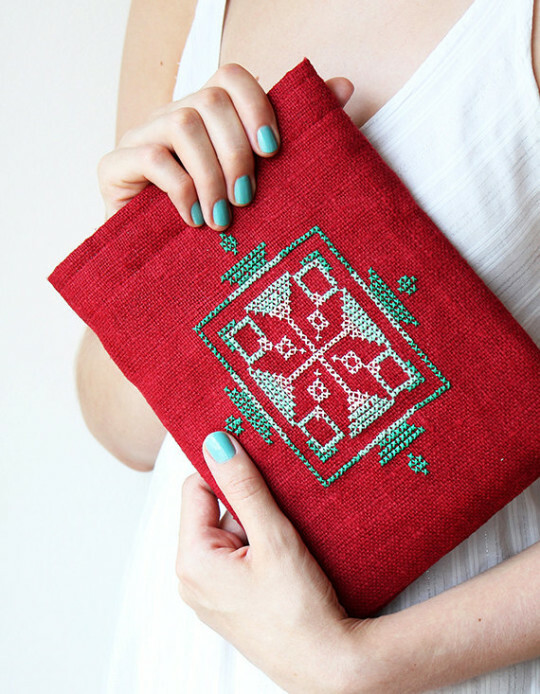 This great-looking, handmade sleeve is crafted in Lithuania from linen, cotton, metal, and polyester. It features natural cotton lining, beige strap and black pocket with white polka dots. The case is made to order. Nook Tab 4 7.0 is not on the list, but you can specify the dimensions in the message to seller. Having in mind that a lot of other 7 and 10-inch tablets are listed, it shouldn’t be a problem. BokoShop offers a lot of other designs for tablets. ⇢ Etsy – $27.80. 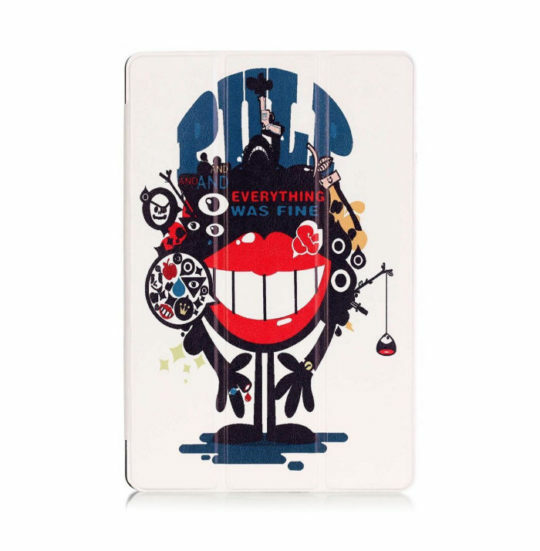 Fintie Samsung Galaxy Tab 4 7.0 Slim Fit Folio Case. Will also fit the 7-inch Nook Tab 4. This is a premium cover made from vegan leather. It can transform into a horizontal or vertical stand. A soft, non-scratch microfiber interior prevents the device from dirt and scratches. 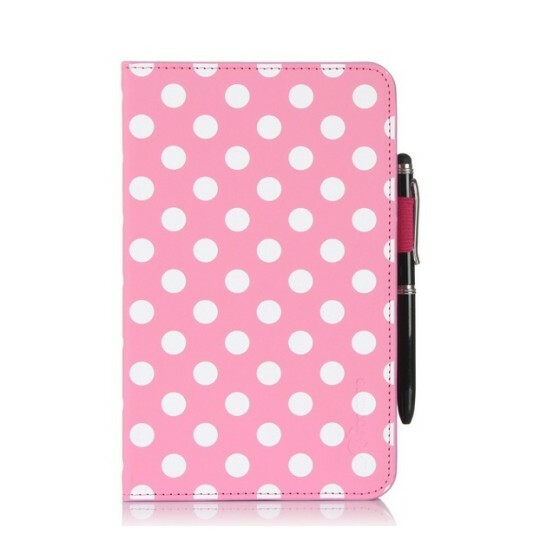 The case comes in a variety of over 20 bright colors, including Panda Pattern, Polka Dot Magenta, Orange, Navy, and Houndstooth Black. A version Nook Tab 4 10.1 is also offered. ⇢ Amazon – $9.99. 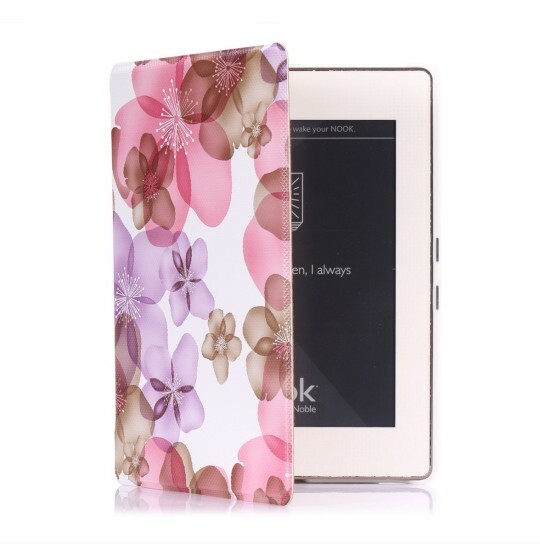 Ivy Fashion Series Flip Stand Case for Nook Tab 4 7.0. 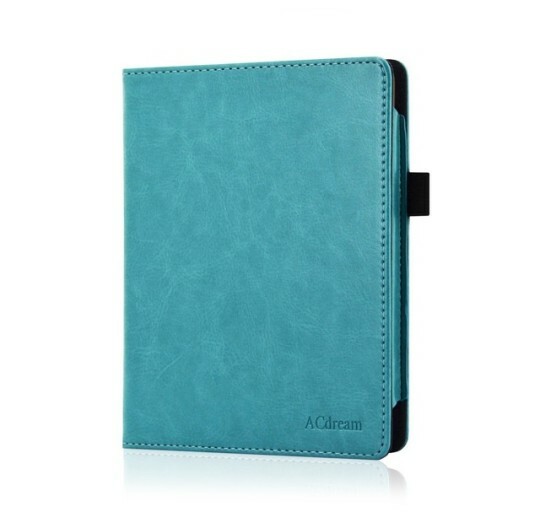 This beautiful case is made from polyurethane leather (outside) and microfiber (inside). It can be used as a stand. It was designed specifically for Galaxy Tab 4 7.0, so it offers a convenient access to all functions, cameras, buttons, and ports. Ivy Series is available in six designs, including Flowers & Butterfly (shown above), Peony, and Wintersweet. ⇢ Amazon – $10.99. MoKo Slim-Fit Samsung Galaxy Tab 4 7.0 and 10.1 Folio Cover Case. Fits also Nook 4 7.0 and 10.1. Padded front cover, hard plastic back, and specially formed corners offer solid, all-around protection. 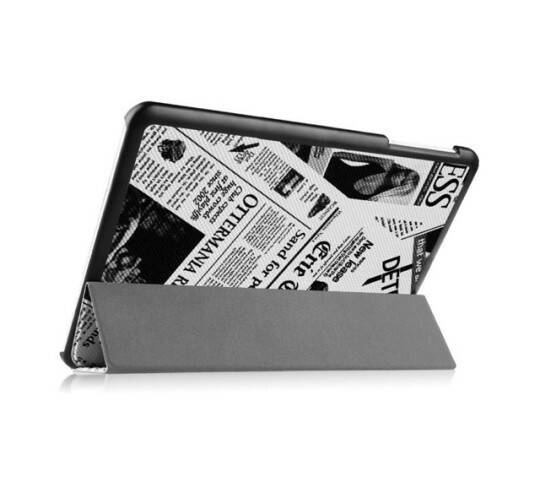 A special design of the interior converts the tablet into a stand with multiple viewing angles. The case is equipped with an interior hand strap for comfortable one-handed use. Available in several colors and patterns. Please note that not all versions are available for the 7-inch Nook Tab 4. ⇢ Amazon – $15.99. 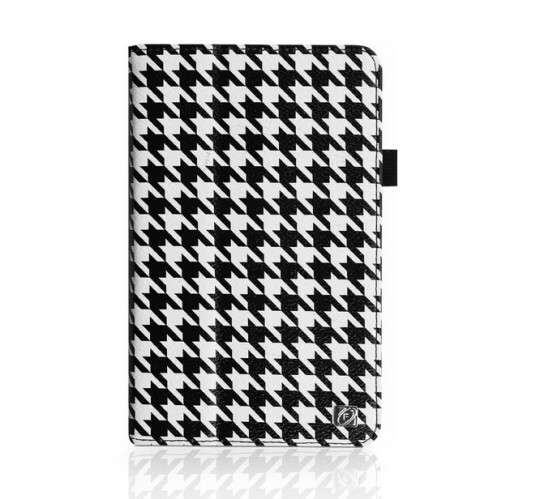 ACdream Nook Tablet Flip Case. For Nook Tab 4 10.1 and 7.0. The case is made of high-quality polyurethane leather, with a soft microfiber interior. It can transform into a stand, supporting two positions: viewing and typing. The case has a smart holder for stylus (the pen is not included). The microfiber on the inside has the same color as the outside. 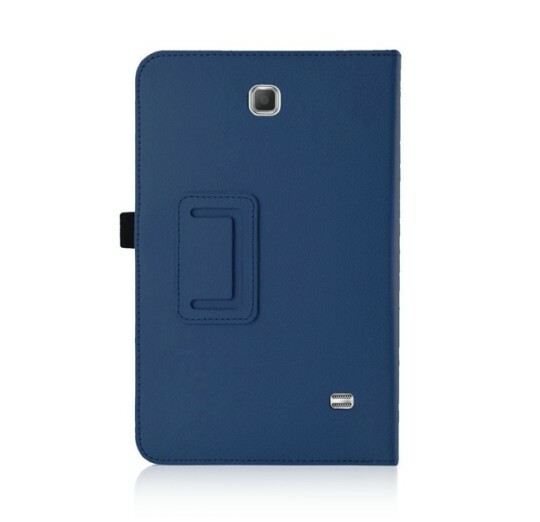 The case is available in five colors: Black, and Dark Blue (featured above). ⇢ Amazon – $8.99. 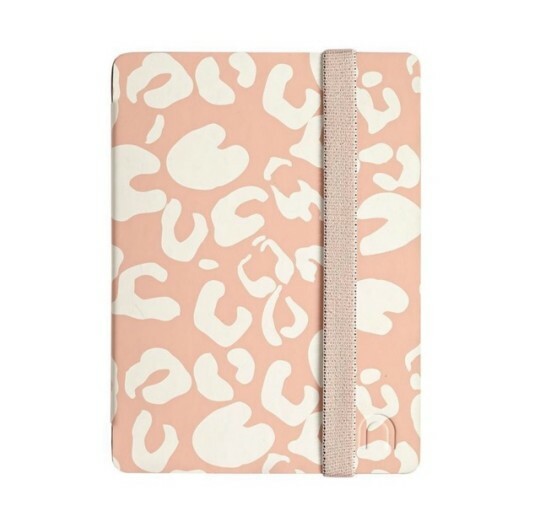 InStyleLiving Tablet Case. 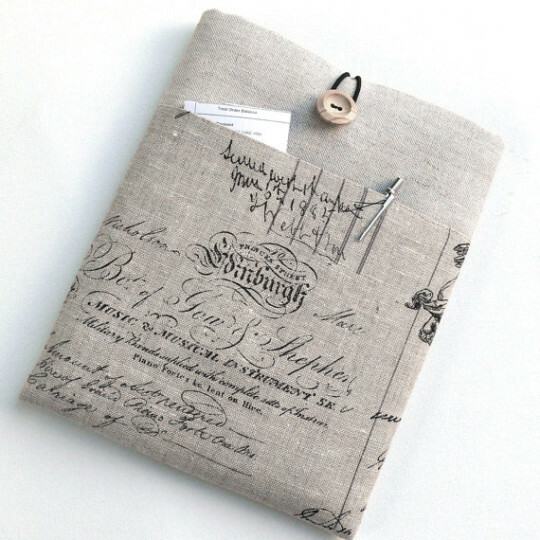 An elegant tablet sleeve made from designer 100% linen fabric. It is padded with high-density shock absorbent to shield the device from impact. 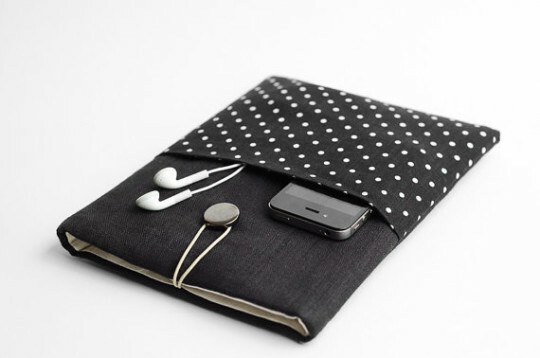 There is a front pocket for accessories, pens, headphones, and even a smartphone. 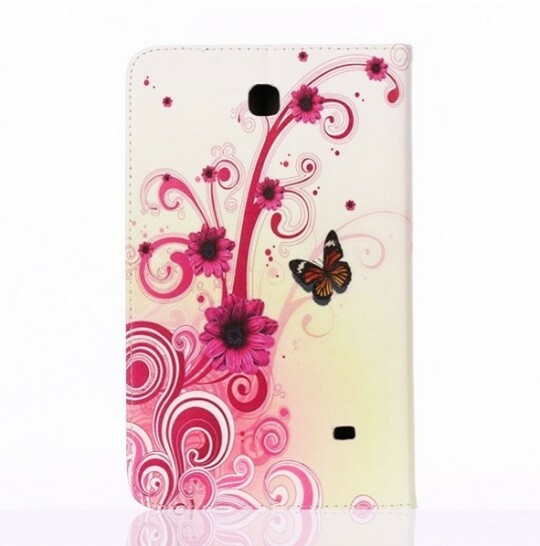 In the message to seller specify which device you want the cover to fit. Please provide also the dimensions, shown in a table at the beginning of this post. ⇢ Etsy – $32.99. 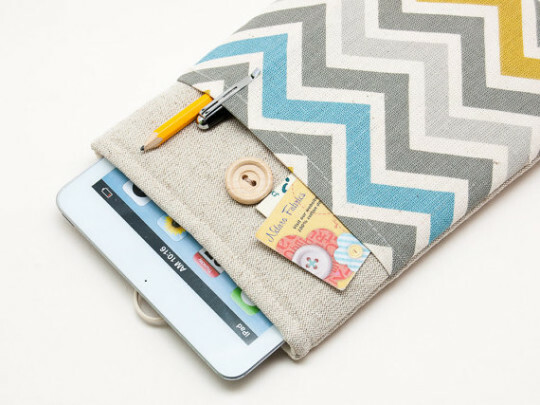 Original Samsung Galaxy Tab 4 7.0 Book Cover. A good result of a cooperation between B&N and Samsung is that if you don’t find a good official cover offered by one partner, you can always switch to the other. 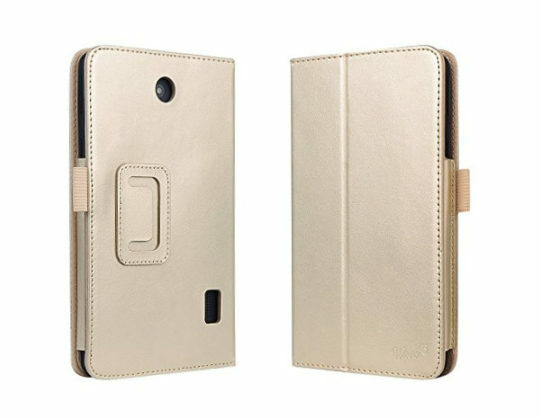 This slim smart cover was designed by Samsung specifically to fit Galaxy Tab 4 7.0 / Nook Tab 4 7.0. It’s made of extremely durable materials and transforms into a stand with two viewing angles. There is also a version for Samsung Galaxy Tab 4 10.1. ⇢ Samsung – $49.99. 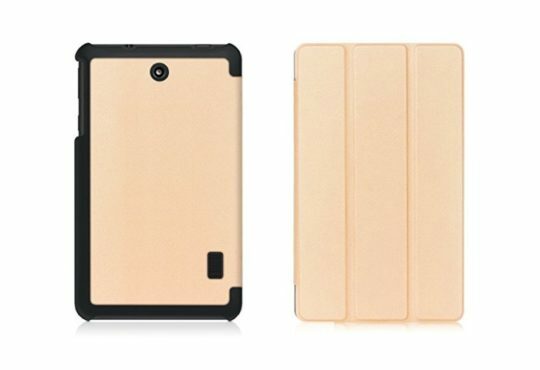 MoKo Slim-Fit Nook Tab S2 8.0 Case. 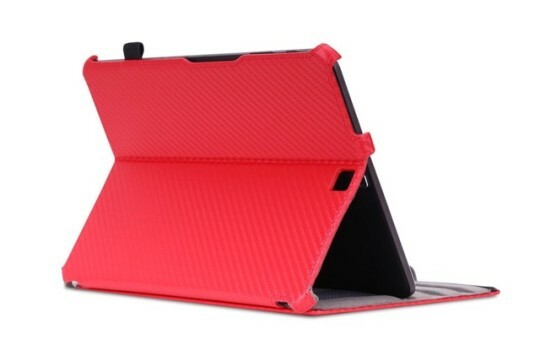 Moko offers this case for Tab S2 in a few color versions of the carbon fiber series. It supports sleep/wake function and provides the full protection thanks to a special construction of the shell. The built-in stand offers three positions. The case includes an interior hand strap for comfortable one-handed use. There are five carbon fiber colors available, including Red (above), Black, and Light Blue. ⇢ Amazon – $15.99. 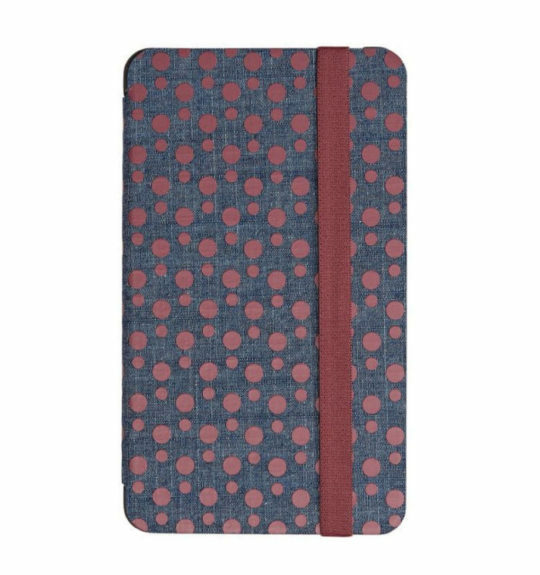 Fintie Smart Shell Nook Tab S2 8.0 Case. 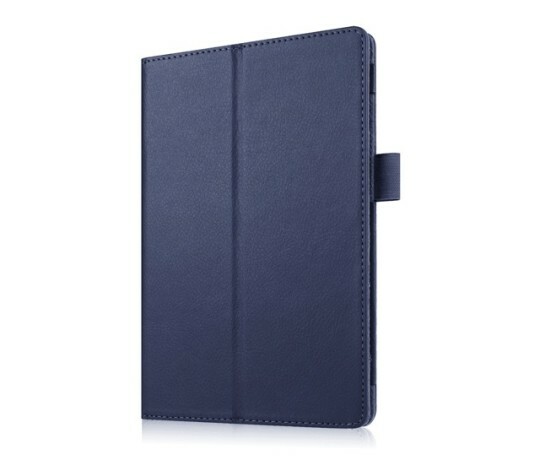 This compact, lightweight hardback is one of the most popular cases for Galaxy Tab S2 cases on Amazon. It’s made from premium quality polyurethane leather and features a magnetic closure and a built-in stand. Fintie Smart Shell is available in a wide range of colors that will meet all needs and tastes. ⇢ Amazon – $16.99. 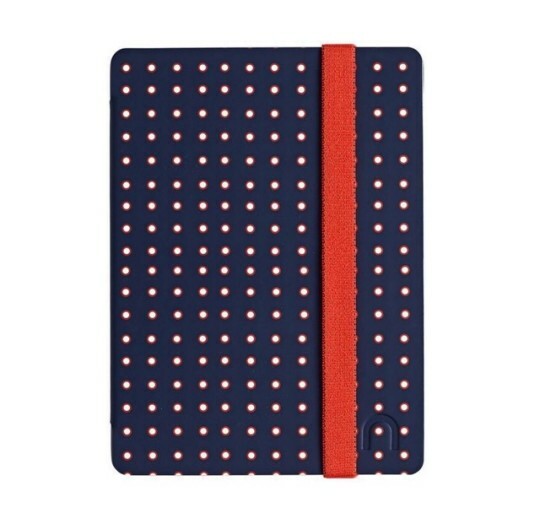 Phocket Nook Tab S2 8.0 Case Sleeve. 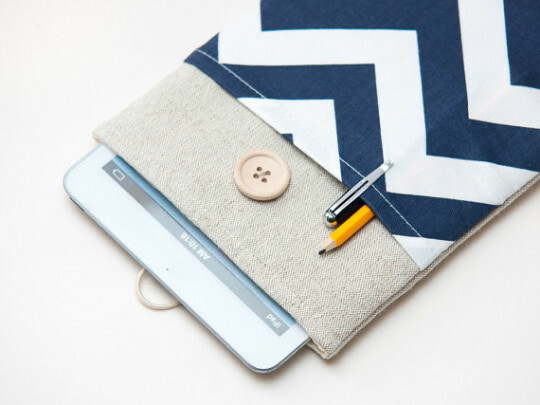 A simple minimalist felt sleeve for Samsung Galaxy Tab S2 and S2 Nook. There is also a version made from a light gray felt. ⇢ Etsy – $18.00. 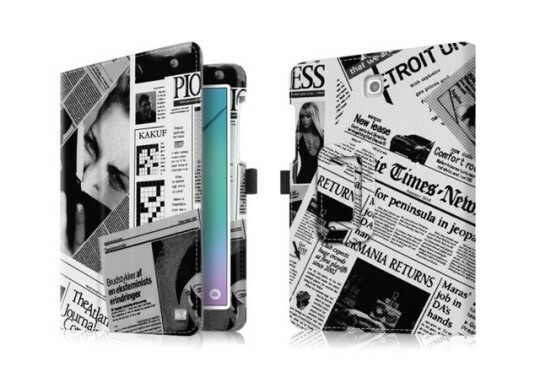 Smart Cover Case for Samsung Galaxy Tab S2 Nook 8.0. All you would expect from a lightweight hardback case cover at an affordable price. It’s made from a premium quality faux leather, it allows access to all ports and supports auto sleep/wake function. 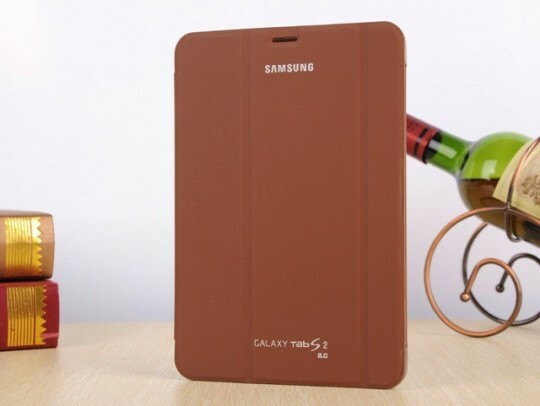 Original Samsung Galaxy Tab S2 8.0 Case. Will also fit Nook Tab S2. Original accessories are usually more expensive than the ones produced by other companies. The original Samsung case for Tab S2 is the most expensive item listed in this overview. 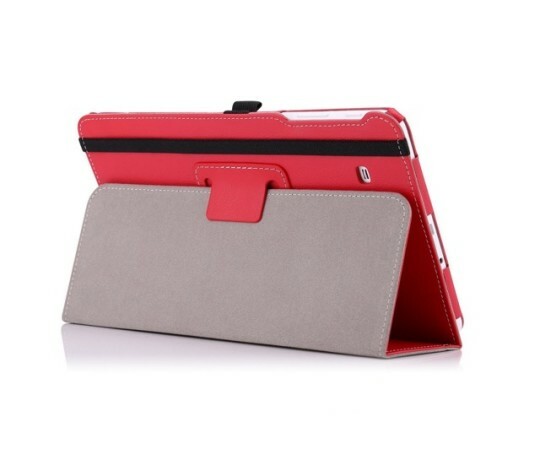 Having in mind that the tablet itself is from a premium shelf, this case will give it an extra style boost. 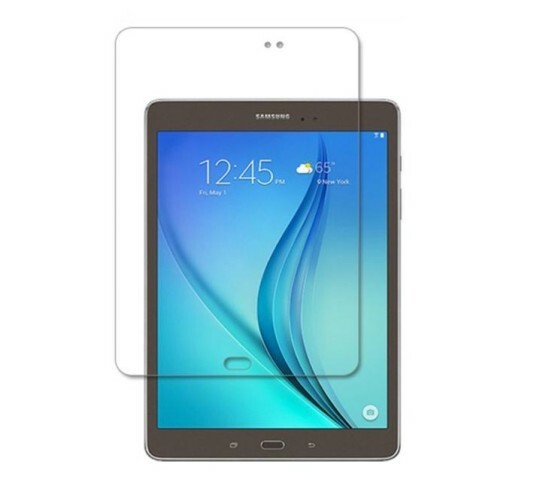 White Linen Sleeve for Samsung Galaxy Tab S2. A premium sleeve made of a high-quality natural washed linen. 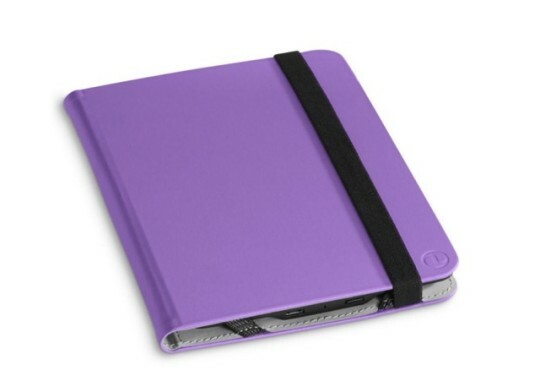 Inside, the 5mm lightweight foam will protect your tablet from scratches, bumps, dirt and grime. 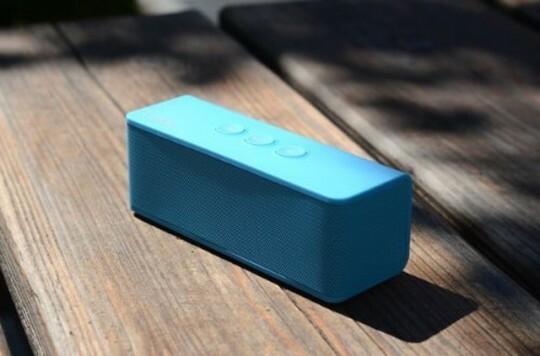 In Blue Case shop, you’ll find the same design in several color options. ⇢ Etsy – $23. 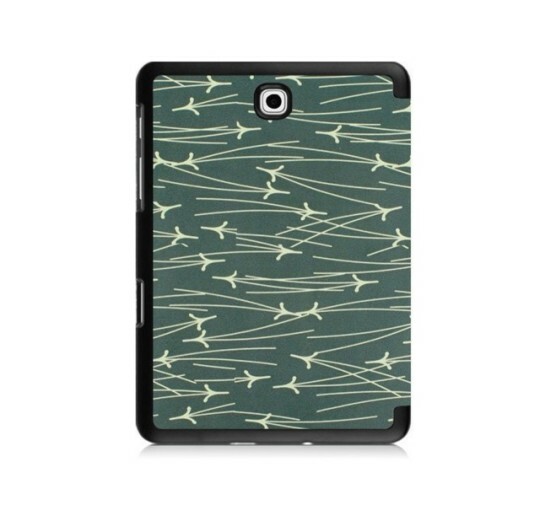 Fintie Samsung Galaxy Tab S2 Nook 8.0 Folio Case. 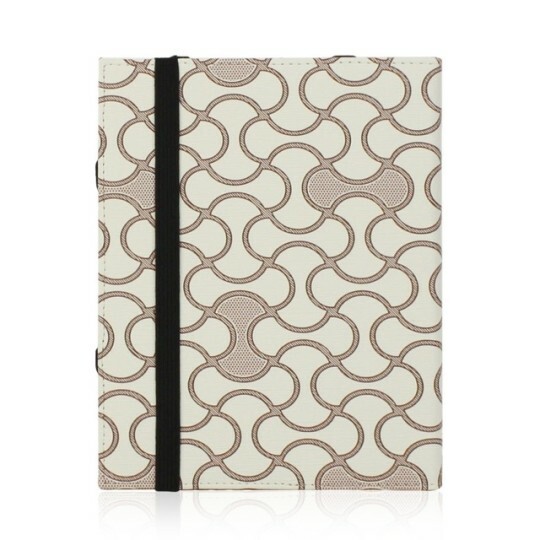 Fintie presents a line of elegant book-style folio cases. 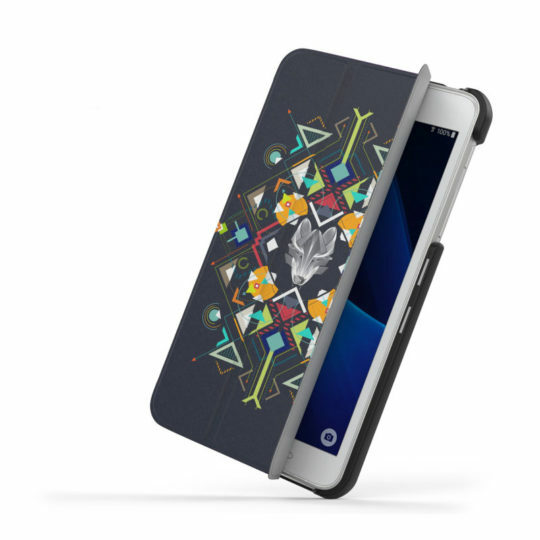 The design has a flip capability to transform the case into a viewing or writing stand. A soft inner liner and protective corners help safeguard Nook Tab S2 against scratches and damage. A plenty of colors to choose from, including Brown, Navy, and ZA-Newspaper (featured above). 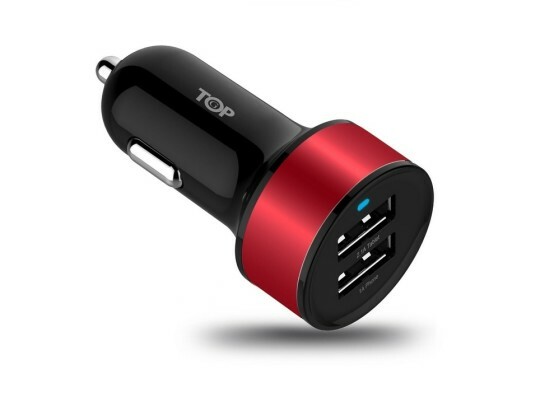 ⇢ Amazon – $13.99. 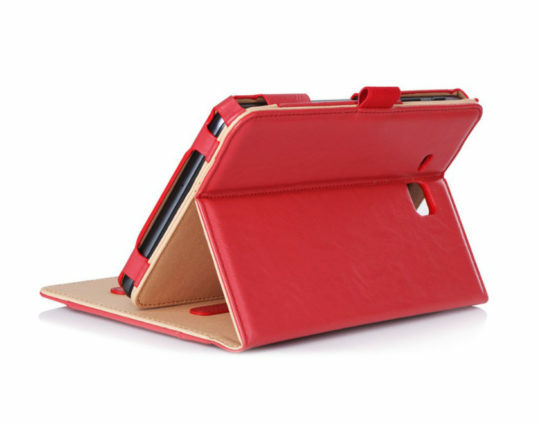 Folding Stand Leather Case Cover for Samsung Galaxy Tab S2. A light stand cover with the exclusive look and affordable price. It’s made from high-quality faux leather, with the interior lined with a soft material to protect the tablet’s screen from scratches. Barnes & Noble Samsung Galaxy Tab S2 8.0 Case. This case was made for Galaxy Tab S2 Nook, so it will also fit the regular S2 8.0 model bought elsewhere. 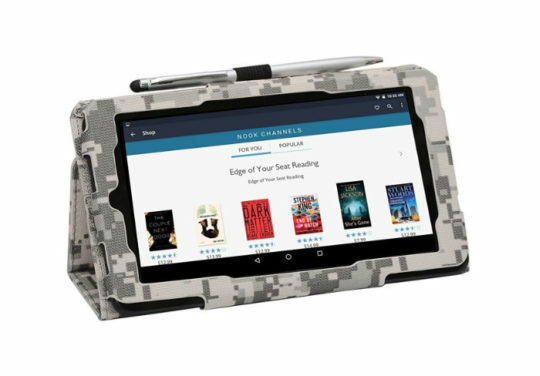 Barnes & Noble is famous for making stylish accessories for their e-reading devices and the range designed for Galaxy Tab S2 8.0 Nook is a great example. 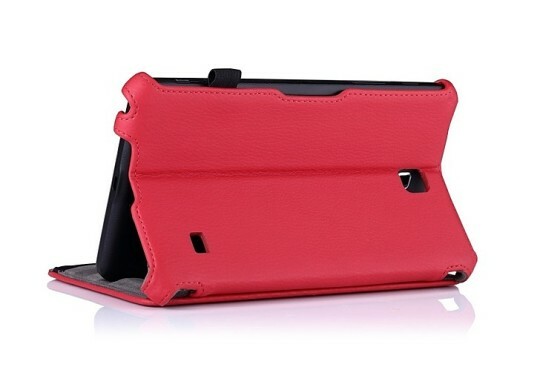 Slim Samsung Galaxy Tab S2 8.0 Case. Will also fit Nook Tab S2 8.0. The case is ultra-slim and finished in a durable synthetic material that gives it a rugged but stylish look and feel. It has a built-in stand and supports a sleep/wake function. 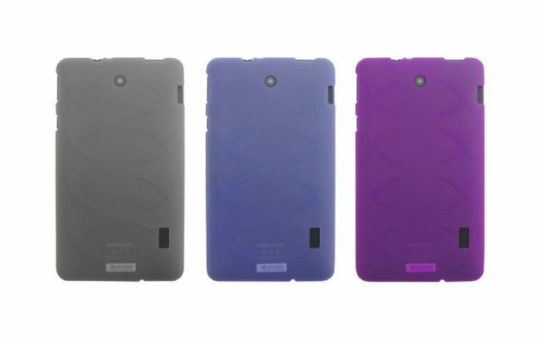 The case is available in nine colors. Besides Brown (shown above), you can pick up White, Red, or Dark Blue. ⇢ eBay – $10.99. Blu Case Felt Samsung Galaxy Tab S2 Sleeve. 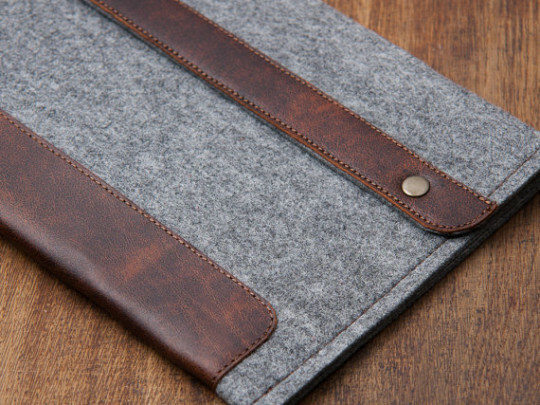 From a Blu Case Etsy shop comes a stylish sleeve made from 4mm wool felt and genuine leather. This particular design is using a gray felt, but you can also order a much darker color if you want. 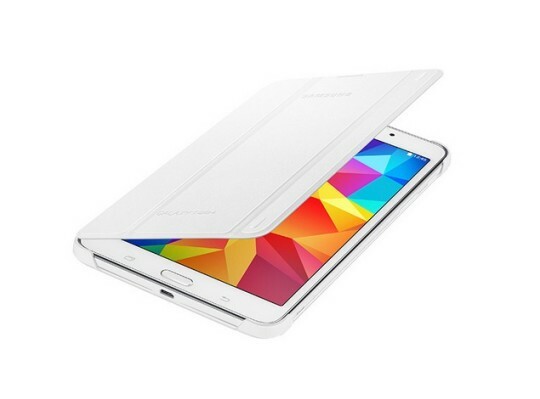 The sleeve is made to order, and Samsung Galaxy Tab S2 8.0 is on the list of supported devices. ⇢ Etsy – $23. 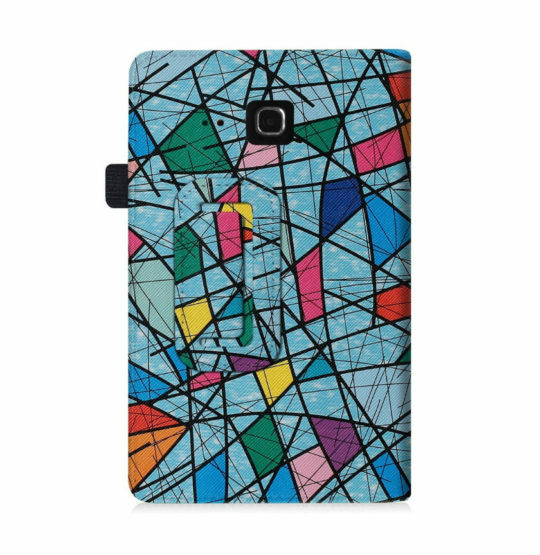 ProCase Samsung Galaxy Tab S2 8.0. Premium case with the high-quality composition leather exterior and soft microfiber interior. It features auto sleep/wake, magnetic closure, and a two-level stand. The case comes equipped with a bonus ProCase stylus pen. You can choose from three colors: Black, Red, and Brown. ⇢ Amazon – $15.99. 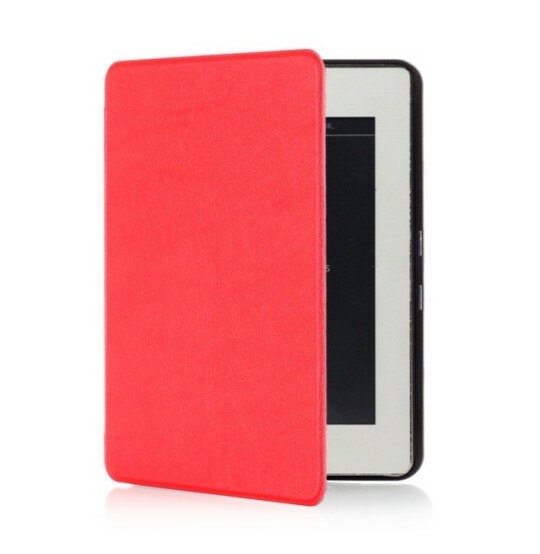 Moko Slim Folding Nook Tab E 9.6 Case Cover. 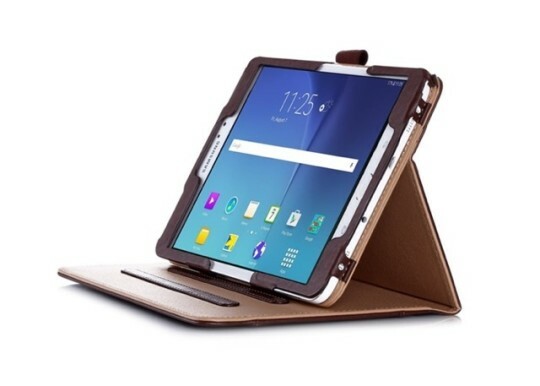 This lightweight and protective case was designed specifically for Samsung Galaxy Tab E, and will fit perfectly the Nook Tab E. There is a built-in flip stand offering two positions – for viewing and typing. Magnetic clasp ensures the case won’t accidentally open. 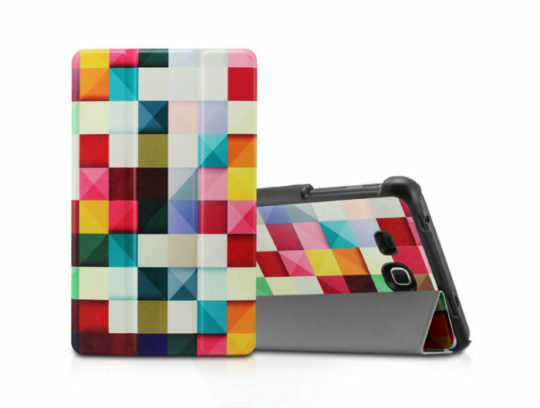 The case is offered in several colors, including Red, Pink, Light Blue, and Zebra Black. ⇢ Amazon – $13.99. Oh Koey Tablet Sleeve. This adorable sleeve has been made from an imported Japanese elephant fabric mixed with other beautiful fabrics in a great patchwork pattern. You can find other designs in Oh Koey shop on Etsy. There is no Galaxy Tab E on the list of supported devices, but you can write the exact dimensions in a message to seller. 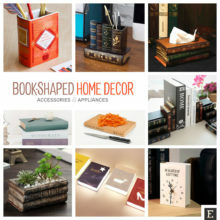 ⇢ Etsy – $26.95. Barnes & Noble 2-Way Stand Cover. Original B&N accessory for the 9.6-inch Nook Tab E. Unfortunately, the company doesn’t give any details about this product. We can only guess based on the picture, that the cover can be used as a horizontal stand, and that it folds back completely for a convenient one-handed reading. There are several plain colors to choose from, including Beige shown above. ⇢ Barnes & Noble – $44.95. Gala Born Linen Sleeve. This gorgeous sleeve is natural linen and hand embroidery, and comes from a Tribal collection offered by Gala Born. There is a soft lining for extra protection. The sleeve closes with wooden button and hand’s braided string. There are dozen of other designs available in Gala Born shop on Etsy. When making an order, type in a message to seller the name of your device and its exact dimensions. ⇢ Etsy – $68. 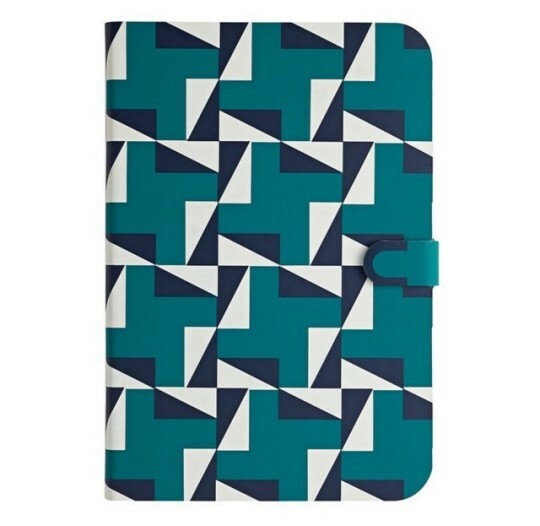 Fintie Stand Cover for Nook Tab E 9.6. From the most popular case producer on Amazon comes a slim cover that has a built-in stand (typing or viewing). It’s made from a durable polyurethane leather and has the microfiber inside what will prevent the screen from scratches. 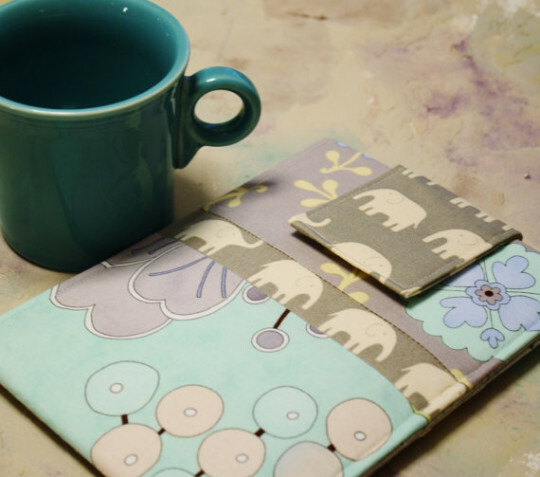 Cases from Fintie are available in several colors and designs. One of them is Newspaper, featured above. ⇢ Amazon – $16.99. Whether you’re reading, watching a movie or surfing we the web, enjoy the new Nook Tablet’s beautiful IPS display. The long-lasting battery keeps you powered up to read at home or on the go for up to 7 hours of reading, web browsing, and video watching. Millions of Android apps, games, movies, songs, and more are available on Google Play – instantly accessible wherever you go. The long-lasting battery keeps you powered up to read at home or on the go for up to 11 hours of internet usage. The device is designed with stunning resolution to give you an incredible picture quality, whether you’re watching a movie, snapping photos, or playing a game. Enjoy a quick read for every moment with our digital discovery feature—a complimentary daily selection of book excerpts, magazine articles, and rich commentary. Amazingly thin & lightweight at only .22” thick and 9.4 ounces. The Super AMOLED 2048 x 1536 (OXGA) display delivers deep contrast, rich colors, and crisp details to maximize your reading and entertainment experience. The integrated fingerprint scanner makes unlocking your tablet quick and secure. Additionally, every family member gets their own unique profile and password. Your new tablet already packs in a lot of space with 32 GB of built-in storage. If you ever need more, add up to 128 GB with an optional microSD card. And, rest assured, all of your purchases are stored for free in Nook Cloud. With years of bookselling experience, Nook offers you more than just a great tablet. Enjoy personalized recommendations based on what you’ve loved over time and exclusively curated collections from our experts. The 9.6″ HD display is the perfect size to deliver the excitement of all your favorite movies, TV shows, magazines, comics, and games. Go portrait format to enlarge the page. Turn it 90° to take in the whole spread. Books and magazines open up with air at this larger size. Throughout, you’ll enjoy the award-winning Nook Reading experience. Buy single issues on a whim, or subscribe and get your favorite magazines and newspapers delivered straight to your Nook the moment they hit newsstands. Single episodes and full seasons of top TV Shows, along with thousands of movies available on Nook Video. Preview any title free, then buy and watch instantly. Your new tablet already packs in a lot of space with 16 GB of built-in storage. If you ever need more, add up to 128 GB with an optional microSD card. Additionally, all of your purchases are stored for free in Nook Cloud. 16 GB on-board memory. Add up to 128 GB with an optional microSD card.